Permission is granted to reproduce these articles in magazine, newspaper or newsletter format, provided that credit is given to Share International and clippings are sent to: PO Box 41877, 1009 DB Amsterdam, Holland. Copyright (c) 2008 Share International. All rights reserved. On 27 March 2008, Benjamin Creme was interviewed on the Paris radio station Ici et Maintenant. The programme was seen live around the world via the internet. At the end of the interview Maitreya gave a blessing to the audience and a message, via mental telepathy, through Benjamin Creme. I am close to you indeed My friends. I am so near to you that you have but little time to wait to see Me. Many of you have been very patient, but the timing of My approach to you and the world is governed by many laws, and I come at the earliest possible moment. Look for Me then sooner than you think possible. Perhaps not tomorrow, or next week, or even next month, but very, very soon. My heart is filled with the urge to complete this great endeavour. This will need the assistance of all who love their fellow men. Men must save the world which ails badly. My Masters and I will show the way to do so. It gladdens Our hearts to see the start already made by the ordinary people of the world. It is to them I speak now. Raise your voices. Tell the world your needs: your need for peace; your need for justice and freedom; the need for all people to live in harmony, no matter the religion, the colour, the race. All men essentially are One. They are My brothers and I love each one. My blessing of love flows to you all. If and when a man of Mars lands his spacecraft on Earth and looks around him, he must surely be amazed by his surroundings. Unless his mission has taken him to the countryside, he will wonder how the people of Earth can tolerate the abject monotony and raw ugliness of so many towns and cities of the world. The teeming squalor of the poorest is matched only by the brash, arid rawness of the richest. Wherever one looks on Earth, it would seem, office blocks like gigantic ants’ nests cover the ground, surrounded by endless rows of near identical cubes in which the exhausted ants recover in sleep. Of course, our friend from Mars would discover, there are exceptions to this ubiquitous life-denying mediocrity, but, he will find, they are all relics of the past, proudly maintained and preserved as tourists’ pleasure grounds while the local population make do in silent envy. The above is, of course, a caricature, but it is not for nothing that among Maitreya’s priorities is the beautification of our cities. A city is more than just a place where money can be made and the fruits of the making enjoyed. It is a Centre, a Magnet which draws groups of people together to heighten and enrich the consciousness of all. It is a place in which the soul of the country which it graces can manifest and adorn the achievements of men everywhere. A city, therefore, should be a place of beauty, of great variety and colour, with many quiet areas for meditation and rest. It should not be too big; many modern cities repel rather than attract their citizens. They should be open and welcoming to all, sharing their special gifts with local and visitor alike. A city is a charged centre of energy, each one different and expressing many different rays or qualities. Together, they fashion the personality of a country and provide the opportunity for the soul of the nation to be expressed. When Maitreya and the Masters are working openly the importance of certain cities will become clearer. As great centres of population, the coming science of energy will naturally blossom in cities. The new Science of Light will transform the outer appearance of all cities in the world. The energy of light, direct from the sun, will flow into and from containers of various size while the Power of Shape will determine the nature of the energy needed and stored. It will, no doubt, take many years to transform the cities of today into the places of beauty which they will become. However, men need to be able to visualize that such cities can and will be built, and existing cities slowly rebuilt. As the population of Earth decreases, as it will, cities will reach their ultimate best size and flourish. Q. Share International recently published two letters that seemed to focus on publicity, making your information known more widely. (1) Why is it so important? (2) Would it be correct to say that Maitreya is placing a lot of emphasis now on the need for effective advertising of your information whether about lectures, books, the magazine and the information itself? (3) Would it therefore be accurate to say that the groups around the world could be doing a lot more, and perhaps more effective, advertising? (4) Should the groups consider keeping their publicity campaigns local and national, or might it be an idea to consider co-ordinated worldwide advertising? A. (1) Our work is to awaken humanity to the fact of Maitreya and the Masters’ return to outer work; to create the climate of hope and expectation for this event, and so allow Maitreya and His group to enter our lives without infringing our freewill. Maitreya is emerging very soon and so there is very little time left to prepare the way. (2) Yes. (3) Yes. (4) All of these. Q. Sharing is an admirable aim and also what is needed in the world, but it is the one thing which people are least likely to do. Just take a look around. Even otherwise ‘good’ people just don’t seem to be willing to do that. Selfishness, it seems to me, is pandemic. I wonder what on earth has to happen to change this mindset. Being willing to share is very different to being forced to share. What does Maitreya have up his sleeve to change the mindset of 6 billion people, other than the Day of Declaration experiences, which I don’t think will be enough to do it, as many will put it down to fraud, hallucination, etc? A. This is a quite common reaction to my information, even by people who have no difficulty in accepting the fact of the Masters or Maitreya, or the urgent need for sharing as the only way to justice and peace. However, I believe it is profoundly mistaken. It is true that we have fallen into a deep materiality which demonstrates as the stranglehold which commercialization now has on every aspect of our lives. Commercialization, Maitreya warns, is more dangerous to humanity than an atomic bomb. One of the problems is the difficulty the average person has in visualizing the means by which sharing will come about, be organized. People tend to think of sharing in purely personal terms: they imagine being personally forced to share their income with strangers across the seas. The principle of sharing, when humanity sees the necessity, will be organized globally, each nation giving to a central pool only what it has in excess of its needs. From the common pool the needs of all will be met. This will not happen unless and until humanity accepts the principle of sharing. Our free will is never infringed by the Masters. In reality, in the really real world (not the commercial world) we have no option but to share. Every other method has been tried and has failed and has led to the present sorry state of the world economic structure (which is teetering on a knife-edge) and which has brought the ecology of the planet to a dangerous imbalance. Sharing alone can establish the necessary trust between the nations required to tackle seriously the many dangerous problems facing humanity. What has Maitreya ‘up His sleeve’ to coax us to do the right and only thing to save our planet? His energy of Love which goes right to the heart and brings out the best in men and women. No one knows the power of Maitreya. Q. I would like to serve in any way I can, though whether I am worthy is another matter. I listened to Benjamin Creme’s talk in New York on the internet, and wept like a little child both during and after it. It felt like coming home. A. There is no one, anywhere, who is unworthy to serve. It is for that that we have come into the world. If you can “weep like a little child” on hearing one of my talks then you are most certainly ready to respond to Maitreya’s call to serve. Don’t delay! Q. I have been an observer of Benjamin Creme for many years and have read his books. I was telling everyone that Maitreya was coming years ago! So where the heck is He? I am getting really depressed and losing all hope. The other day I read about a little girl being tortured by being put in scalding hot water by her father. If this is karma, then karma is cruel and stupid and who or whatever initiated it must be sadistic. Yes, I am angry that the so-called Masters (and I don’t deny that they may exist) must be sitting by watching the horror we call ‘humanity’ play out in the torture of children. If we are to have peace in this world, the only peace the world shall see is the permanent wiping out of human beings. My view is: we are not up to the task. There is something inherent in us humans that apparently makes peace impossible unless the Masters impose peace on us and take over the reins completely. A. I can understand your frustration and anger but do not lose hope now. This is nearly the end of a long wait imposed on Maitreya by us, humanity. At any time in the last 30 years we had the opportunity to bring Maitreya forward openly to the whole world. It only needed starting the process of cleaning house, putting our houses in order and beginning to act as the one humanity. All the pain and suffering (which rightly appals you and millions more) is the result of humanity being ‘out of step’ with its true self and opting greedily for the commercialization of its life. People in large numbers are dehumanized by greed and gross materialism. The result is the horrors you read about daily. Maitreya knows better than any one of us the Laws which bind Him in relation to our actions. He is the Lord of Love, His Compassion is limitless and He demonstrates it in millions of ways no one ever hears about. Hang on just a very little longer and your anger will disappear in tears of joy. Promise. Benjamin Creme’s Master confirms that Maitreya has recently influenced our advertising in a very positive way. On going to press we now know of five incidents where Maitreya has helped significantly; the first taking place before Benjamin Creme’s lecture in Barcelona in February 2008. Coming from Maitreya, we take this as a prompt to increase greatly our advertising from now on, as Maitreya’s emergence appears to be very soon. This brings in the question of funding and we know that many readers will want to assist with the work. Any and all donations, which should be marked ‘for advertising’, would be gratefully received. We saw the letter (‘Sign of the time’) in the April 2008 Share International where Maitreya was helping groups with ads about the Reappearance. Then we remembered something that happened with our ad campaign for Benjamin Creme’s lecture in Barcelona in February 2008. One of our ads in the campaign was placed in Metro free newspaper, which has a fairly big distribution. The ad was placed on Thursday 21 February, two days before the event. We have placed ads in this paper before and they are normally situated in the culture section, towards the end of the newspaper. To our amazement, this time our ad appeared on page two – a very prominent place. Also that page had news about a much-awaited event: the arrival of the high speed train that connects Barcelona with Madrid and that had been delayed for years. In recent months the building work has caused immense chaos to everyone in Barcelona, so we thought many more people would read our ad there, rather than in the culture section.Was the ad placed there by chance, or is it possible that there was some Hierarchical help involved? For the 2008 Easter season, the San Francisco Bay Area Transmission Meditation group decided to spend $2,000 to run a series of 30-second television advertisements on a local television station. We had worked with this station in the past and the sales person there knew us. She was sympathetic to our message and said she would try to get us a few free extra spots. Our contract was for 16 ads to run during the two weeks before Easter. When we received the log (which shows the exact time and date the ad actually ran) from the station, the ad in fact had run 30 times, including during the week after Easter. There were well over 200 people who called our number and listened to the four-minute recorded message. Of these, over 40 left their names and addresses to be sent further information. We recently read in Share International that Maitreya is prompting groups to advertise by manifesting several advertisements Himself. We were wondering whether the original 16 ad-spots had multiplied to 30 with a little divine help? I had a wonderful rapport with the man and spoke for about 30 minutes. But at the end, I had to regrettably turn down the offer. He asked me if it was only a matter of price. I said it was a fantastic opportunity, but we just didn’t have enough budget. When I phoned him again 30 minutes later, he had negotiated with his supervisor in the meantime and lowered the price a bit more. In the middle of my second phone call, my husband took over the negotiation. We negotiated again the next morning, and they lowered the price even more and we accepted the offer. Four days later, I remembered the man I spoke with who was very powerful and expressed a lot of joy at being able to bring us such a wonderful offer. I asked my husband about him, but he said the man he spoke with was an ordinary sounding man. Was the man I spoke with different from the man my husband spoke with? I enclose a cutting from our free, local newspaper The Advertiser. This photograph and report appeared on two separate pages of the same paper (20 March 2008) and clearly shows the message about sharing. When I phoned to thank them for our double exposure I was told that they were ‘baffled’ by the error. We also got coverage and a photograph in the Sentinel which covers the whole of Stoke-on- Trent, Newcastle-under-Lyme and surrounding areas. This may just be an error but seeing the letter in the April edition of Share International (‘Sign of the time’), I thought it worth mentioning anyway. On the occasion of the Generation 50 Fair in Avignon, France, in December 2007, a man in his 50s came to our booth on Sunday evening to look at the information. We ended up talking about Jesus. My husband, who normally is not involved in my work with fairs, had joined me and was trying to find out whether what the church says about Jesus’ life is historically true. That afternoon, I had been doing some research in Mr Creme’s books for him. The man then said: “Oh, ‘Jesus’, that’s the name of my friend! He went to see another stand. He’s waiting for me at the entrance. Oh, he’s calling me now.” The man then showed us his mobile phone with the name ‘Jesus’ showing on the screen. He then left, supposedly to join his friend Jesus. I thought this was funny, and that his friend was probably Portuguese as this name is common there, and I forgot about it. He also said that we are all Christs, that there are many Christs and Buddhas, that we can do the same since we have Christ in us. He also mentioned the overshadowing of Jesus. Then they looked at the file of miracles and when they left I gave them the leaflet on the 30th anniversary of the presence of Maitreya in the world. Who were these men? And who were the woman and child? 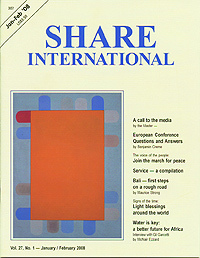 On 29 March 2008, my birthday, at Benjamin Creme’s lecture in Paris, my husband and I were working at a stand selling the French version of Share International magazine (Partage International). During the break, a woman of about 60, wearing a suit, came up to us. She leafed through one of the magazines and, pointing her finger at Maitreya’s photo in Nairobi, asked: “Will Maitreya appear like that on television?” Answering herself, she went on: “Nobody knows.” So I told her that, for the time being, Maitreya was appearing under different guises, creating thoughtforms according to circumstances. I showed her photos in the magazines of Maitreya as a flute player, a West Indian man in Hyde Park and a woman begging in Florence, saying to her that they were all different appearances of Maitreya in a guise. Pointing to the woman in Florence, she exclaimed: “There he is a woman! She does look like me! See how much she looks like me!” I thought she was not like her at all. But she kept insisting: “Look! Look! Same hair!” She was white-haired and the beggar woman was black-haired. “Look! Look! Same mouth!” Afterwards my husband told me that she was completely toothless, which I did not notice because I was focusing on her eyes. She wore thick glasses, which made her black eyes seem bigger. But she kept on insisting as though she wanted us to clearly understand that she was a female appearance of Maitreya too. She was speaking so loudly with such a high-pitched voice that I looked with amusement left and right to see if it was causing any excitement, but it was not. I felt as if we were apart from the rest of the gathering (the three women, the toothless lady, my husband and I), inside a sparkling bubble, a champagne bubble. Then our attention was totally taken by the three women and I did not see the woman leaving. This magic moment was over. If this lady was really Maitreya, then this was a great birthday gift. (1) I enclose a photograph taken in December 2007. Beside the front door of my flat is a flower stand decorated with pine cones. I observed them and noticed that, incredibly, one, then another one, was growing. 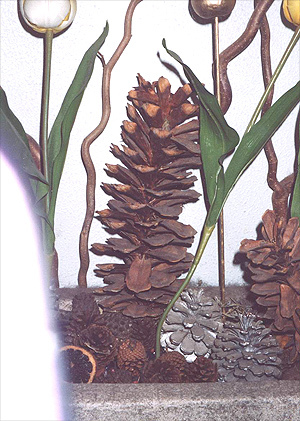 I wondered if the phenomenon was real or not so I took a photograph as a testimony and waited a few days: I could see without doubt that one pine cone was much bigger. Before taking the photograph, I inwardly wished for a blessing on the image, as a confirmation of what was happening. When I received the photograph, there was this sign! I was so joyful. Was it a blessing? Did this pine cone really grow? (2) During the lecture given by Benjamin Creme in Paris on Saturday 29 March 2008, I was manning the book-stand with some friends when a man wearing a dark suit, carrying a briefcase, looking radiant and smiling, came up to me and bought Benjamin Creme’s latest book. He then asked quite precisely for The Laws of Life which a co-worker showed him. He insisted on this book, “the purple one”. He was sure of his choice. My co-worker nudged me. At that moment, the man looked at both of us in turn while laughing and said: “I know you.” He paid for the two books with a big note and then went to his seat. 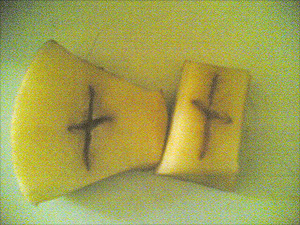 On 8 April 2008 I cut a potato in half and found a cross in it. Was this a miracle? On 14 February 2008 I went shopping at around 1pm and immediately saw patterns of light on the walls. They seemed to be appearing on one building out of three at the beginning of the street, and then on each building located on my right. I couldn’t believe my eyes. It was not the first time I’d seen patterns of light in Paris. Recently, they are appearing more frequently – almost every day. I was amazed by the sudden and unexpected abundance of patterns. They were on all buildings, even on the high school walls, and some were also visible on the pavement. There must have been one hundred of them at the very least. Their shapes varied from ‘X’ to ‘V’ drawn within circles; others looked more like chicken leg-bones. I felt a great joy in my heart and remembered Maitreya’s words that He was going to “flood the world with signs”. Since I moved into a new flat in 2005, I started seeing light patterns on the wall in front of my building in Paris. I knew about the patterns of light but wasn’t particularly interested in them until a few weeks ago: when moving my office into my son’s former bedroom I suddenly found myself face to face with some of them. I was rather amused by the creativity of these mysterious and often changing forms, sometimes very luminous; different from the usual pale reflection emanating from the windows on that wall. Now I contemplate these luminous forms from my balcony every day, and realize that they bring me joy. I started seeing patterns of light four years ago  in the factory where I worked. At that time, I was going through a hard time and was afraid of losing my job. Their presence was a great comfort to me and made me feel that the Masters are with me, that I am not alone to face my problems, and my burden was somewhat relieved. Jan Pronk has had a distinguished career, both as a prominent European politician and as a senior United Nations official. He has played an important role in promoting sustainable economic and environmental development and served as the UN Secretary-General’s Special Envoy for the World Summit on Sustainable Development held in Johannesburg in 2002. In the 1980s he was Deputy Secretary-General of the United Nations Conference on Trade and Development (UNCTAD) and Assistant Secretary-General of the United Nations. He has also served as the treasurer of the Brandt Commission. He served three terms as Dutch Minister of Development Co-operation and one term as Minister for the Environment: Prime Minister Wim Kok described him as the “minister for the national conscience”. From mid 2004 until the end of 2006 Pronk lived in Khartoum, as the Special Representative of the Secretary General of the United Nations in Sudan, where he led the UN peace keeping operation (UNMIS). Jan Pronk was interviewed for Share International by Eva Beaujon. Share International: Reports are showing that the Millennium Development Goals may not be reached by 2015. You have stated that it is precisely the success of globalization that is one of the major causes of increasing inequality between rich and poor, and the increase in the number of poor. Jan Pronk: Increasing inequality is a fact. There are numerous indicators for this. The main problem is that globalization has gone in a direction where everything revolves around facilitating the world market. This has resulted in some profiting from that globalization, while others are disadvantaged. Inequality is growing as globalization speeds up, with some people getting richer more quickly, while others are getting poorer at a faster pace. People are increasingly marginalized. They are the very poor, the people who are continuously driven from their land to vulnerable areas, which are hardly viable ecologically, because less and less water is available due to climate change. In our own society, ‘illegal’ immigrants are not welcomed. As the scarcity of water, energy and fertile land grows, the struggle for access to those scarce resources increases, and those with a head start will appropriate the resources and keep others out – another cause of the rising inequality. It is no longer a question of the very rich against the very poor, as was the case in the earlier stages of the capitalist process. A ‘democratization’ of capitalism has taken place so that we now have a ‘top layer’ plus the world’s broad ‘middle class’. The very wealthy and ordinary middle class are doing well. Most inhabitants of Western countries, with a few exceptions, belong to that group, so there is also a measure of responsibility for the ordinary citizen of the West who profits from that process. No one is guilty, but everyone is responsible. What we also see is that Western social democratic parties, including my own (Dutch) Labour Party, are no longer dedicated to the welfare of the weakest members of society as they were in the past when their focus was to help the working class. The Labour Party has ‘developed’ along with the erstwhile working class, which has now become part of the middle class. They have forgotten the poor, the illegal immigrants in our countries and the poor in the rest of the world. They have also softened their previously critical attitude towards capitalism, while capitalism itself has grown in strength through globalization. SI: The growing gap is not only taking place between countries, but within those countries – Western and developing countries alike. You were involved in trying to help resolve the conflict in Darfur. How does this gap affect a country like Sudan? JP: Globalization has made it easy to invest around the globe: the new expanded middle class trades within its ranks throughout the world. Countries are internally divided; just as there is a wealthy class in Khartoum, in China and India, for example, there are also hundreds of millions of people in those countries who are left far behind. The Developing World is replicating what the industrialized world did to them – the wealthy of the developing world are now discriminating against their own poor compatriots. The government of Sudan does not spend one dinar on providing safe drinking water or education for Southern Sudan or Darfur, causing a further increase in inequality. Khartoum is booming: there is oil, a lot of investment and expanding industrialization. Politically it is a dictatorial system, where potential revolt by the poor is suppressed by force. The worldwide middle classhas the means and the power and it decides how much of the national budget goes to education or healthcare, for instance, and they tend to want it to be used mostly for their benefit. SI: One of the greatest challenges of this century is the climate. The world is warming up faster than was anticipated. We know what needs be done but implementation is very slow. Jan Pronk explained that there are more situations in the world where an opponent cannot be defeated because he has his roots in the population. He continues: You have Hamas, for instance, and Hezbollah and in Somalia, the Islamic Courts. Some groups commit human rights violations, but that is largely due to the conflict becoming increasingly violent. Ignoring them will make them more violent, making it harder to talk to them. And it will become harder to justify it to your own population, because of the violations of human rights they are committing. Secondly, because these groups are not succeeding politically, the population in these countries turns away from them and chooses more radical, extreme positions: from PLO to Hamas, from Hamas to a more violent wing of Hamas, and from Hamas to Islamic Jihad. You get increasingly farther away from your objective – lasting peace. By excluding your opponent – you turned him into an opponent yourself – you are contributing to the continuation of the conflict and more victims. At some point, you will have to invite that opponent to the table. I am all for peace troops and peace interventions for the protection of civilians, but it must be with the approval of the entire Security Council or with the approval of all parties concerned. Unilateral intervention, as happened in Iraq, only leads to more violence and war. Intervention disguised as peacekeeping, like in Afghanistan, is to the detriment of all in Afghanistan. SI: What about the risk of these and other conflicts spreading? JP: This happens because people elsewhere give explicit support to one side in the conflict, because they don’t trust the international community, the US and the UN. Some factions use that distrust as a pretext not to have to solve their own conflict. Another factor is that a number of conflicts are inherently ‘trans-national’, that is to say, they are not contained within national borders; they are ethnic, tribal, political, cultural or religious in origin. The conflict directly impacts communities in other parts of the world, thereby extending even further. This explains why terrorist activities move to other parts of the globe. SI: How could this have happened so easily? JP: A country may be a so-called democracy but there is a power elite that can bend the facts to its will and purpose, can manipulate information and can present its own goals in a perfectly acceptable guise. You are selling something to your own population. That was very clearly the case with Iraq. Later, the same lies were sold to the international community. The invasion of Iraq was based on lies, American official lies. You ask how this could happen. Maybe there were certain vested interests in the US that did not want to correctly inform the President and vice-President. But as President and vice-President, you are also responsible for not being well informed – that is how democracy works. Other countries that support America, and continue accepting the same arguments and peddling them to their own people, share the responsibility for a breach of the international legal order. Mr Pronk went on to outline what could be done to counter such situations. JP: Strengthening the democratic process is of the utmost importance. You do it by aiming for as much openness, opposition and counter-intelligence as possible. Individual citizens must constantly be alert. You need a free press. There have to be political parties that can take over; that means leadership that leaves after a few years, so that you get another government. Let us hope it happens in the US. It was somewhat the case in England. The problem is that it doesn’t automatically mean that there will be new and different policies. In the Netherlands, for example, a new government did not mean that an investigation into the war in Iraq was allowed to take place. It goes on and on: governments have a lot of power to manipulate people’s opinions, through the media and information processes. That worries me. There is more and more money for these purposes. On the other hand, fortunately, you have the globalization of information through the internet as well as the increasing general level of education. Nevertheless, those in power have a big advantage and if they happen to be up to no good, they also have access to the military machine. SI: Does the media play a part in keeping the lie going, especially if they are very commercialized? PR: Yes, and in the US the media are totally commercialised. You have certain independent public media which are interesting, like C-SPAN, but there aren’t many of them and viewer numbers are small. It is a very dangerous development when the general means of conveying cultureare dominated by one value system. Naturally, it virtually guarantees the chances of the lies remaining intact. Let’s consider education. Changes in the education system in recent decades in most Western countries have led to education for the job market. Courses are shorter, and more job-oriented, including at university level and a lot of education is financed by business. So, yet another means of conveying culture becomes vulnerable and is under threat. Of course, people can found other universities and students can protest. All that is possible, because there is freedom, but it happens infrequently and on a small scale. Alternatively, it can lead to a sudden uprising. That is the case when people don’t feel respected by society. Take, for example, groups on the margins of society economically, like the people in the banlieus (suburbs of social housing) in France. What you get is a violent uprising coming from another value system and not being understood by the ruling middle class who subsequently suppress such uprising with force. Between 15 and 22 March 2008 people gathered in cities around the globe to mark the fifth anniversary of the invasion of Iraq and to call for a ‘world without war’. In the US there were more than 1,000 actions in 50 states, in cities large and small, demonstrating against a conflict which has claimed more than 4,000 of its soldiers. In San Francisco, around 7,000 people took part in a night walk organized by the group ANSWER on 19 March, the anniversary of the war’s start. Chants of “Occupation is a crime, from Iraq to Palestine”, “No more war” and the “People united will never be defeated” echoed through the packed Mission District. Among the speakers at the event was Cindy Sheehan, whose son Casey was killed in the war. In Europe, around 500 people marched through Stockholm city centre, Sweden, in freezing rain, carrying banners with messages like, “Five years of war, one million dead”. “I’m here because I think it is extremely important to demonstrate against American policy in Iraq, especially now that the media is focusing less on the tragedy there,” said Leif Staalhammer, a 67-year-old actor. Around 600 people also demonstrated in Sweden’s second largest city, Gothenburg, while in Norway some 200 people marched through the centre of Oslo to the parliament building. With food prices rising 40 per cent on average globally since last summer (2007), food riots are breaking out in poorer countries around the world. Sir John Holmes, undersecretary general for humanitarian affairs and the UN’s emergency relief co-ordinator, told a recent conference in Dubai that escalating prices would trigger protests and riots in vulnerable nations. He said food scarcity and soaring fuel prices would compound the damaging effects of global warming. “The security implications should also not be underestimated as food riots are already being reported across the globe. Current food price trends are likely to increase sharply both the incidence and depth of food insecurity”, he said. Demonstrations in southern Haiti left four people dead when the crowds, protesting against the rising costs of food, started blocking roads, looting shops and shooting at UN peacekeepers in the town of Les Cayes. Violence also erupted in other parts of Haiti during several days of protests. When armed protesters broke into the UN compound in Les Cayes and started shooting at peacekeepers, UN troops fired back, killing a young man. In the unrest that followed three more people died. Prices of staple foods in Haiti, such as fruit, rice and beans, have increased by 50 per cent in one year. Haiti is the poorest country in the Americas; 80 per cent of the population lives on less than $2 a day. On the continent of Africa, the situation is no better: there have been food riots in Cameroon since February 2008, while widespread protests against food price hikes broke out in Ivory Coast, Mauritania, Senegal and, most recently, in Burkina Faso, where a nationwide strike against price rises was planned. Since the end of 2007, 37 countries have faced food crises, and 20 have imposed some sort of food-price controls. In Egypt, the price of bread has gone up 35 per cent and cooking oil 26 per cent. As a result, the government proposed ending food subsidies and replacing them with cash payouts to the needy. The move caused so much public uproar that the government was forced to put the plan on hold. “A revolution of the hungry is in the offing,” said Mohammed el-Askalani of Citizens Against the High Cost of Living, a protest group established to lobby against ending the subsidies. Although it is a particular and politically complex case, Zimbabwe’s food prices reflect the general global trend: the country is experiencing 100,000 per cent inflation. Meanwhile, in Morocco, subsidies for essential commodities have grown fivefold over six years. The cost of rice has risen by 300 per cent in Sierra Leone; the government announced that it aims to start producing rice by 2009 and make rice imports illegal. And in these countries, too, the authorities are nervous about growing public anger and widespread protest. “Escalating social unrest as we have seen in Cameroon, Mauritania, Burkina Faso and in Senegal could spread to other countries” warned Kanayo Nwanza, vice president of the International Fund for Agricultural Development (IFAD). To deal with public anger and the growing crisis, the governments of Cameroon, Senegal and Ivory Coast have stopped levying taxes (value added tax, VAT) on main staples. Cameroon also increased wages for public workers; Sudan increased subsidies for some foods; and Egypt suspended rice exports for six months. We present a selection of quotations on the theme of freedom and justice – from Maitreya (Messages from Maitreya the Christ, and Maitreya’s Teachings – The Laws of Life), Benjamin Creme’s Master (A Master Speaks), and Benjamin Creme’s writings. Millions today live in conditions of abject misery and abuse, exploited by tyrants masquerading as their leaders. Yet the people, for the most part, suffer in silence, fearful that resistance will make the unbearable even worse. Can humanity be persuaded to look on change with a bolder eye; to accept that the ills of the world must be cured or man will perish? For how long and how deeply must men suffer before taking action on their own behalf? Maitreya’s task will be to show men that their suffering is unnecessary; that the remedy is in their hands even now; that together they are invincible. He will show that the only barrier to freedom from fear is fear itself; that a new world awaits its creation, based on justice and trust. We are souls in evolution. Therefore all that pertains in our life which reflects that reality, the soul reality, the creativity of the soul, is in tune with the best art of living. That which is known, that which is already defunct, is simply memory, that which is carried over from the past and is useless but liked, sentimentally held on to, by millions of people, is detrimental to the right structures for the art of living. Trying to live in the past destroys freedom, it does not confer it. Live in the present and look to the future. Sometimes we can look through a window and see the past but we cannot claim it. Injustice is a denial of man’s divine potential; it separates man from man and humanity from God. Throughout the world, many are struggling to free themselves from age-long injustice, exploitation and tyranny; to set down at last the yoke carried by their forebears. We, the watching Hierarchy, commend their struggle, for We see it as the expression of the Divine Spark in all men, yearning for freedom and justice. We give them Our Hand as We gaze with compassion on their plight. Humanity has been given a ridiculous choice: you can either be free or have justice. If you live in America or Europe, in the main you opt for freedom. Americans in particular love the idea of freedom but there is little justice in America and not much more in Europe. If you lived in the Soviet bloc (which no longer exists as a bloc but the consciousness is still there), you opted for justice but had no freedom. This choice is totally absurd. Both freedom and justice are divine, and divinity is indivisible. You cannot have freedom without justice, or justice without freedom.